← Welcome to the new blog – SSIMagine what’s next! You’ve seen Office Space, so you know the song. I won’t attempt to reproduce the lyrics here but you know where I’m coming from. I’ve been a Microsoft Certified Trainer (MCT) since 1996, and “trainer” has been a key part of my identity for longer than that. I love the technology side of my work; building software is a challenging and fulfilling endeavor, and I’ve never found anything quite like the creative outlet that comes from envisioning, designing, and creating something out of nothing but will. But the other side of my job is also compelling: helping people get the most out of the software and systems that they use. Being able to tell a story, to paint a picture, to connect the dots to help someone achieve goals that were previously out of reach, to see that “light bulb moment” where a student understands a new or complex concept – this is often what makes the difference between a good day and a great day. Just as working in technology is a process of continuous learning, working as a trainer also requires an ongoing professional investment. Fortunately for MCTs, there is an online worldwide trainer community to provide guidance and support, to share resources and foster growth and improvement. But sometimes a trainer needs to step up a little more. Sometimes classroom time and online interactions aren’t enough to take your training skills to the next level. Sometimes you need something a little more personal and face-to-face. 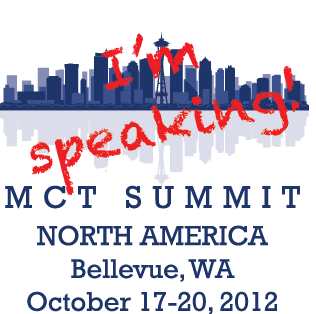 And in this context, I’d like to mention the North America MCT Summit 2012, coming to Redmond, WA on October 17th. This community-organized event will include a wide range of trainer-focused sessions covering technology and “soft” presentation skills. There are also custom “MOC Cram” sessions designed to help get trainers quickly up to speed on new courseware and for even a Train The Trainer event for IT trainers who are not yet MCTs but would like to earn the MCT credential. I’ll be there, both presenting and attending, and if you’re a trainer you should be there too. Over the years I have attended and presented at many technical conferences, but it is the trainer events that I remember most fondly. Not only does an MCT Summit better target the specific needs of IT trainers, it also provides an ideal venue for professional and social networking. Trainers I have met at MCT conferences have become clients, employers, contractors, employees and perhaps most importantly, friends. Sometimes being a trainer can be a lonely profession – it’s just you and your students, and no one really understands what you do, except for other trainers. Being surrounded by people who know exactly what you do every day, who understand the unique joys and challenges of being an IT trainer is an experience not to be missed. So come to Redmond – the MCT community will be waiting. Figuratively. My art skills are the stuff of legend, and not in a positive way. What other careers require near-constant skills upgrades, as new versions of software are released and new computing paradigms introduced? If you’re an MCT and are logged in with your Windows Live ID Microsoft Account, this link will work for you. Otherwise, not so much. Both technical deep dives and how to best communicate new technologies to your students. Instead of attending general sessions and hoping to glean a tip or trick or two on a topic you already know, imagine having a session dedicated to moving beyond your existing level of knowledge. Instead of attending general sessions and gritting your teeth while you watch someone whose core competencies don’t involve presentations, imaging having a conference where every session is delivered by someone with deep presentation and classroom experience, where you can pick up tips on what do to, not just what not to do. It sounds pretty nice, doesn’t it? Yes, I have this song going through my head now too. This entry was posted in Conference, Training, Work. Bookmark the permalink.